Just off lower Seventh Avenue, there is usually a line outside a very discreetly marked brown door - the opening to the adorable, lovely, and inventive Little Branch. I highly recommend it for a date spot! From the same people who brought us the praised Milk & Honey, Little Branch knows how to do it right with fresh ingredients and innovative cocktails. 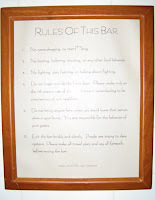 And, just like M&H, they have the same list of rules - see picture for reference. This creates an atmosphere that I cannot pinpoint - visit it for yourself! In a pre-prohibition bar style, every ingredient is freshly made. Grapefruits and oranges are squeezed a couple of hours before opening, and nothing gets mixed until ordered - master mixologists at work. The process is almost as magical as the drinks. So grab your guy or gal and jump in the only line we'll wait in in New York City. Little Branch is located at Seventh Avenue South and Leroy Street.